The Luxor hotel in Las Vegas is undergoing a huge $300 million refit aimed at freshening the place up and removing much of the Egyptian theme that pervades the place (which you’d have thought would have been quite difficult for a gigantic black pyramid!). The refit is being carried out to ensure the Luxor continues to attract visitors amidst the changing nature of the tourists pouring into the city. For the huge new billion dollar hotels that are currently being built in Vegas aren’t just changing the skyline – they’re also changing the type of visitor and their corresponding tastes. Most of the new hotels focus exclusively on luxury, and will therefore attract a much more up-market crowd. As Las Vegas grows up, the existing themed hotels that looked great back in the 1990s when they were built will soon start to look quaint and not a little outdated. Consequently, these hotels are racing to overhaul themselves in an effort not to be left behind. Personally, I’d rather have the themed hotels, as they’re great to see and part of the reason you go to Vegas. I’d much rather the new hotels being built all had mad themes as well, rather than being just very large buildings. I mean, what would you rather go to the middle of the desert to see – buildings like the Venetian, New York New York and Paris, or buildings like Bally’s and the MGM Mirage? But what do I know?! 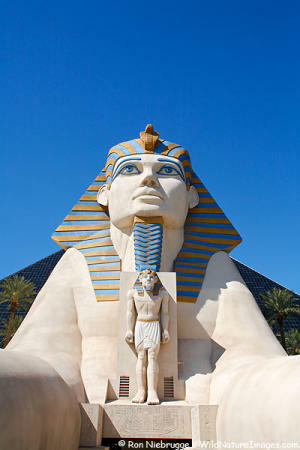 So what’s the Luxor doing with its $300 million to attract the new fresh (and rich!) youngsters that will soon be pouring into the city? Well, aside form changing some of the nightclubs and adding new bars, they’re getting rid of the Egyptian theming throughout the hotel, remodelling the guest rooms and the pool area, and making the atrium more adult by adding more lounges, restaurants and entertainment venues. Most shocking of all though is the rumour that might be doing away with the huge replica Sphynx hat sits outside the hotel. This would be sacrelage! 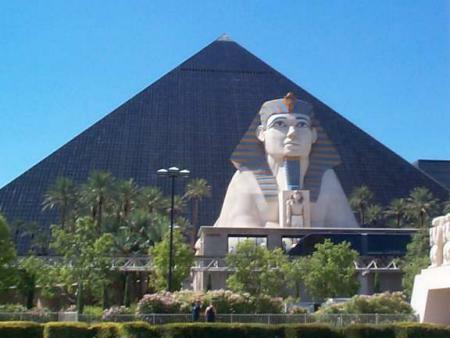 You can’t get rid of the Luxor’s Sphynx – all you’d be left with is a giant black hollow pyramid, causing first time visitors to wonder why a hotel has been built like, well, a giant black hollow pyramid! I don’t like this one bit- update the place, sure, but mad Vegas should be left just as it is – it’s the madness that makes it great! I do not like this at all. They could just update the place with some more restaurants, not make the pyramid an atrium filled with overpriced nightclubs and lounges. I mean getting rid of the sphinx is just getting rid of the hotel’s tourism. Yes we all know they’ll make money but then they’ll finally realize what their hotel was made out to be! I’m guessing Excalibur is next up on the list.